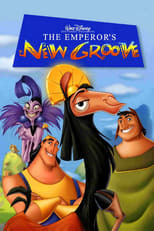 [narrating]: [referring to Kronk's "theme music"] Big, dumb and tone-deaf. I am so glad I was unconscious for all of this. [narrating]: Um, what's with the chimp and the bug? Can we get back to me? [examining his brides]: Let's see here... hate your hair, not likely, yikes, yikes, yikes, and let me guess: you have a great personality. [about Kuzco] I'll turn him into a flea. A harmless little flea. And I'll put that flea in a box. And then I'll put that box in another box. Then I'll mail that box to myself, and when it arrives, [laughs maniacally] I'll smash it with a hammer! It's brilliant, brilliant, brilliant, I tell you! Genius, I say! [Knocks over the potion, which makes a plant explode] Or, to save on postage, I'll just poison him with this! [Holding the human-potion after getting turned into a cat] Looking for this? [Realizes her voice is now high and squeaky] Is that my voice? [coughs] Is that my voice?! [pause] Oh well. Chicha: [smiling] Okay everybody, move aside. [pats her pregnant belly] Lady with a baby comin' through. Kronk's Shoulder Devil: Don't listen to him. He's trying to lead you down the "path of righteousness". I'm gonna lead you down the path that rocks! Guard: Hey, I've been turned into a cow. Can I go home? Kronk: What are the odds that trap door would lead me out here? Kuzco: "...I'm a crumbling canyon wall, and I'm taking you with me." Well not today, pal! [shuffling to dance] Uh-huh, uh-huh, uh-huh-uh-huh-uh-uh. Pacha [uncertainly]: You just saved my life. Yzma: Take him out of town and finish the job, now! Kronk: But, what about dinner? Yzma: Kronk, this is kind of important. Yzma: [starts to protest, but stops] Well, I suppose there's time for dessert. Yzma: All right, a quick cup of coffee. Then take him out of town and finish the job! Kuzco: [trying to calm down] I'm trying to figure that out, okay? [falls and starts whining again] I can't remember! I can't remember anything! Wait a minute. [turns towards Pacha] I remember you! I remember telling you that I was building my pool where your house was. And then you got mad at me-- [gasps in shock, then turns back to Pacha angrily] Then you turned me into a llama! Pacha: Wha--! No, I did not! Pacha: Why would I kidnap a llama? Kuzco: I have no idea. You're the criminal mastermind, not me! Kuzco: [pauses] You're right. That's giving you way too much credit. Pacha: Don't worry your Highness. I got ya. You're safe now. Pacha: No, no, no. It's-It's okay. This-This is all right. We can figure this out. Kuzco: [resigned] Don't tell me: We're about to go over a huge waterfall. Kuzco: [pause] Bring it on. [yells as they go over] Boo-yaaa! Pacha: For the last time it was not a kiss. Kuzco: Well, whatever you call it, [Kuzco spits the water onto Pacha's fire, putting it out] it was disgusting. And if you would've done what I ordered you to do in the first place, we all could have been spared your little kiss of life. [Kuzco shakes off the water from his fur which puts out the fire Pacha has just re-lit] But now that you're here, you will take me back to the palace. I'll have Yzma change me back, and then I'll start construction on Kuzcotopia. Oh yeah! Pacha: Okay, now look, I think we got off on the wrong foot here. I just think if you really thought about it you'd decide to build your home on a different hilltop. Pacha: Because [controls his anger] deep down, I think you'll realize that you're forcing an entire village out of their homes just for you. Pacha: Well, yeah. Uh, nobody's that heartless. Kuzco: Mmmm. [pauses] Now take me back. Pacha: What? Wait, wait. How can you be this way? All you care about is building your summer home and filling it with stuff for you. Kuzco: Uh, yeah. Doy. Me. Everyone else in the kingdom gets it. You're the only one that doesn't seem to be with the programme, eh, Pacha? Pacha: You know what? Someday, you're gonna wind up all alone and you'll have no one to blame but yourself. Kuzco: [sarcastically] Thanks for that, I'll log that away. Now, for the final time I order you to take me back to the palace. Pacha: Looks to me like you're stuck out here because unless you change your mind, I'm not taking you back. Kuzco: [imitating Pacha] Because unless you change your mind, I'm not taking you back. Me, me, me. [Picks up an acorn and throws it at Pacha, hitting him on the head. Pacha looks round angrily] Huh? What? I didn't do anything. I didn't - Somebody's throwing stuff. Yzma: Kronk, why did I think you could do this? This one simple thing. It's like I'm talking to a monkey. Kronk's Shoulder Angel: Whoa now! Yzma: A really, really, big, stupid monkey named Kronk! Yzma: And would you like to know something else? I never liked your spinach puffs. Never! Kronk's Shoulder Devil: That's it! [****s trident] She's goin' down. Kronk, Shoulder Angel, and Devil simultaneously: That'll work. Kronk's Shoulder Devil: [while Kuzco in a bag is about to go over a very large waterfall] Listen big guy, I got three good reasons why you should just walk away. Number one: [points to Kronk's Shoulder Angel] Look at that guy! He's got that sissy, stringy, music thing. Kronk's Shoulder Angel: We've been through this; it's a harp, and you know it. Kronk's Shoulder Devil: All right; that's a harp, and that's a dress. Kronk's Shoulder Devil: Reason number two: [as he does a one-handed handstand] Look what I can do! Kronk: Look, you guys are confusing me, so, uh.... "be gone", or whatever I do to get rid of you guys. Chicha: [angrily] Couldn't see you? Why not? Chicha: Well-well, that's just rude! Chicha: No, no, no, no, no. NO! Emperor or no emperor, it's called common courtesy. Chicha: If that were me, I'd march right back there and demand to see him and you know I would. Chicha: Pacha, I'm fine. This baby's not coming out for while. But even if it was, I'd give that guy a piece of my mind. That kind of behavior just- just- [snorts]. I gotta go wash something. Yzma: Oh, would you, please? That would be just great. [Yzma makes an exaggerated gesture that makes her knock her tea cup off the table] Oops. Silly me. Yzma: Oh my. [Steps out of a shadow holding the potion] Looking for this? Kuzco: No, it's impossible! How did you get back here before us? Yzma: Ah.... [Looks confused] How did we get back here, Kronk? Kronk: Well, ya got me. [Pulls down a chart displaying the progress of the previous chase] By all accounts, it doesn't make any sense. Yzma: Oh well. Back to business. Kuzco: [nervous] Okay, I admit it. Maybe I wasn't as nice as I should have been; but Yzma, you really wanna kill me?! Yzma: Just think of it as...you're being let go. That your life's going in a different direction. That your body is part of a permanent outplacement.